This autumn has been interesting. I’ve changed jobs, had a blog hiccup, and have a lot of unanswered email in my inbox. On the flip side, I’ve cultivated friendships, read some amazing books and made a triumphant return to cooking. But I’ve known for a while that it wouldn’t be in my budget to get gifts for everyone on my list. Instead, I resolved to go the baked goods route for those lovely friends. I’ve made up little confectioner’s bags of Christmas Fudge and this new (to me) recipe of Peanut Walnut Brittle – and I have to say that they’ll be perfectly sweet holiday treats. 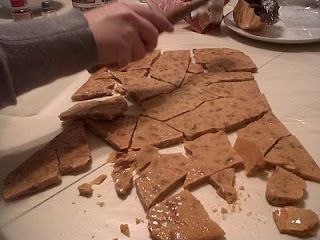 In the interest of full disclosure: I was scared to attempt the brittle. I’ve never done candy or anything (aside from fudge) that required a candy thermometer. Luckily, this is a simple, straight-forward recipe. If you have all of the ingredients ready to go beforehand, you should be just fine. At least, I was. Yay! 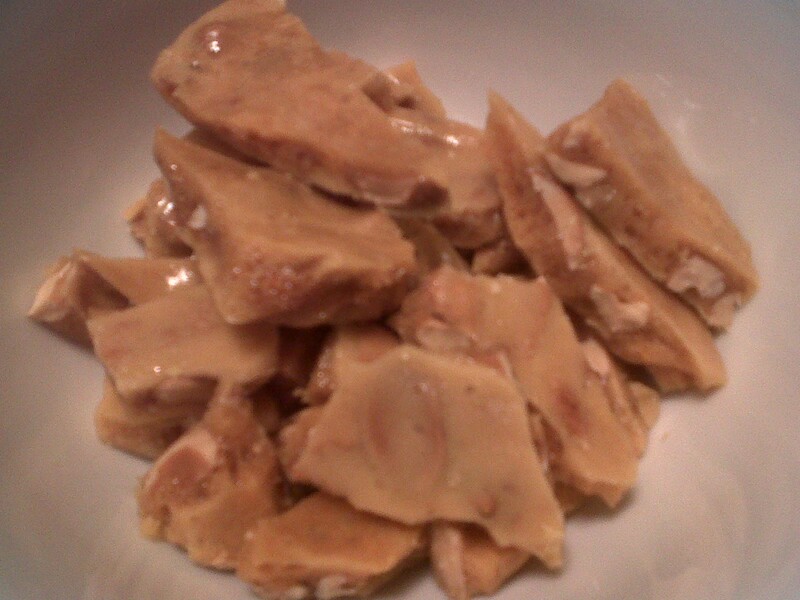 peanut walnut brittle on the right. also in process: peppermint bark! 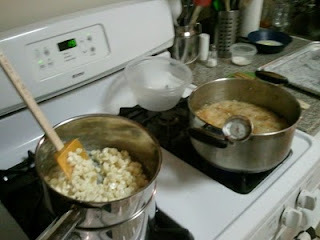 In a heavy 2-quart saucepan, over medium heat, bring to a boil sugar, corn syrup, salt, and water. Stir until sugar is dissolved. Stir in nuts. Set candy thermometer in place, and continue cooking. Stir frequently until temperature reaches 300 degrees F (150 degrees C), or until a small amount of mixture dropped into very cold water separates into hard and brittle threads. 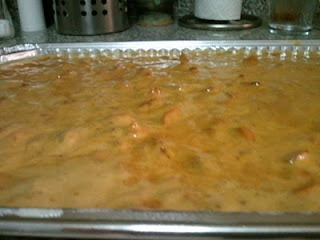 Remove from heat; immediately stir in butter and baking soda; pour at once onto cookie sheet. 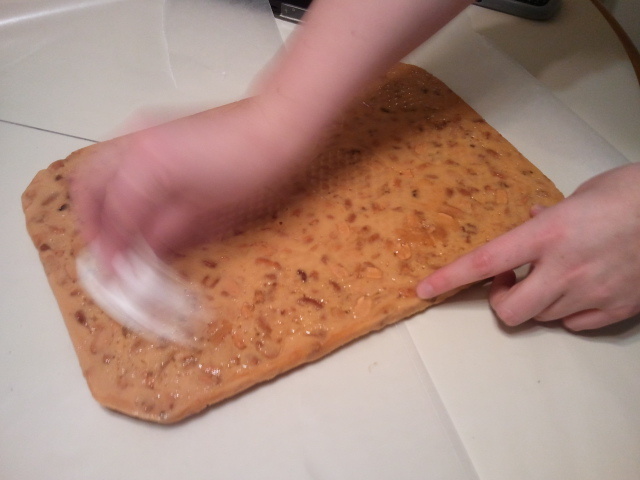 With wooden fork, lift and pull peanut mixture into rectangle about 14x12 inches; cool. Snap candy into pieces. I tripled this recipe and didn’t have any problems, although I waited a bit longer than the recipe called for to add in the nuts. If you DO triple the recipe, have two cookie sheets ready to go – it’ll fill them right up. OH! And most useful tip ever: have boiling water ready to pour into your cooking pot right after you finish with it. Makes cleanup about a thousand times simpler. Store in an airtight container for up to a month! Recommended for: a not-too-sweet holiday staple, a versatile snack, and a challenge for anyone who wants to wander on the adventurous side of Christmas baking. 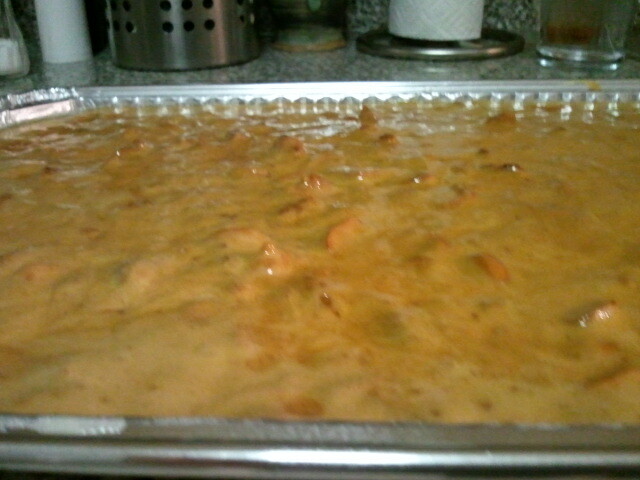 Hey, if you can make fudge, you can make anything! Looks great. Looks yummy, I can only handle a little of that stuff though. Looks great! It makes me wish I could still eat peanut brittle (too tough on the teeth). yummy! baking treats are always special during the holiday season. happy birthday!